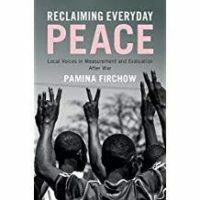 Unlike most books I review, Reclaiming Everyday Peace is not written for a general audience. Instead, Firchow writes for my colleagues who design and implement peace processes world wide, including, soon (I hope) here in the U.S.
As she and now many others see it, peacebuilding projects have been designed by outsiders who have their own criteria for success that are often tied to their own agendas. Firchow and a handful of other colleagues suggest that we have to stop that habit and begin designing peacebuilding projects that reflect the interests and values of the people who live in the middle of conflict zones themselves. Unlike others who tout the value of local peacebuilding, Firchow helps us build those kinds of projects in ways that could cumulate and lead to large scale social and political change. As she sees it, however, it starts by asking members of affective communities themselves to define what peace means for them. What makes her project interesting for those of us interest in that kind of large scale political change is that she develops methods for gathering and measuring those everyday peace indicators in ways that make them useful in other settings as well. This is not the place to go into the details of how she has done that in field work in Uganda, Colombia, and beyond, because the technicalities of doing so would not interest most of my readers. However, anyone who is interested in these issues has to read Reclaiming Everyday Peace as soon as possible.